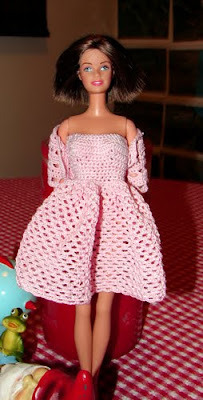 Two Pink Barbie Dresses | Oh Sarah O ! Sarah Barbie is back to show off two new crocheted Barbie outfit's made by me, Sarah O, for my former co-worker. Both dresses were crochet with pink size 10 crochet cotton using the "barbie basics free crochet" pattern found here.